How do you create a winning IT team? As the FIFA World Cup begins, around 3.2 billion people (half the eyes in the world) will be tuning in to watch the game take centre stage in Moscow. It’s a game of strategy, skill and stamina, with strict rules and high stakes for the players involved. But there are many lessons we take from what is seen on the football pitch. Football is not a game of luck or chance, it takes training, tactics, team work, management and resilience – just a few of the key core values that can make a winning team. The same methods can be applied in today’s business world. So as we all turn our attention to the game, what can IT teams learn from the world cup? We spoke to ten leading IT professionals to get their thoughts. Liam Butler, AVP, SumTotal, a Skillsoft company commented, “In the same way every player on a World Cup winning football team needs a personalised training plan, meaningful career growth needs to be enabled for each individual employee. The best performing businesses place learning at the centre of their employee experience, providing opportunities for individualised development and closing the gap between what employees are offered and what they actually need. They craft frameworks that align with the precise skills and capabilities their employees need to prepare for career progression. Technology plays a central role in professional football. Take video assistant referee technology (VAR), which will be trailed at the World Cup for the first time ever this year. VAR has the potential to fundamentally change the outcome of the entire tournament; it will ensure decisions are as accurate as possible without detrimentally affecting the game. It’s the same in a business environment. Offering the right tools and technology makes it easy for employees to continuously develop in the direction of their goals, without sacrificing performance in their current roles." Jeff Keyes, Director of Marketing, Plutora noted, “Teamwork is something that is praised and criticised on a regular basis in the football world depending on the score after 90 minutes, and this year’s World Cup is likely to be no different. While it is easy to see the teamwork, or sometimes lack thereof, from football players on the field, this idea of working as one is often harder to translate into the business world. At the moment, this is no more obvious than in the world of DevOps, where many development and operations teams are still working through smoothing out their passing, dribbling and scoring skills across two disparate parts of the same team. Ed Owen, EMEA Cloud Sales Manager, Zerto said, “Every four years, the best of the best in world football don their country's colours and compete for the right to call themselves World Cup champions. To achieve this, it takes strength, determination and a great deal of resilience – to get up from one aggressive tackle after another, to recover from a gruelling loss in the group stage and to keep fighting until the end of every match no matter the score. Nigel Tozer, GDPR Specialist, Commvault noted, “Should your data governance strategy receive a yellow card? Out on the pitch at this year’s World Cup, the teams will be adhering to a strict set of rules to ensure the game is played fairly. With the GDPR now in effect, businesses need to make sure they do the same, and IT teams will play a critical role in making sure their team abides by the rules. Marianne Calder, VP EMEA, Puppet commented, “Football requires players to operate with speed and agility - they are skills that build the foundation of a winning team. Businesses are no different - agile practices can help you align your team with DevOps concepts and practises. This means the business will be able to quickly respond to change and, for example, fix a problem or adapt to a market change without having a negative impact on the business strategy”. Tom Harwood, Chief Product Officer and Co-Founder, Aeriandi said, "Every footballer knows that – when all is said and done – it’s the fans that are most important. Each and every fan is a potentially game-changing 12th player, and it’s the same for businesses. Being open and accommodating to customers – often via a dedicated contact centre – ensures a great experience for your company’s die-hard fans. But the contact centre is a prime target for fraudsters. Often, criminals gather just a small amount of personal information on a victim from social media sites and attempt to manipulate agents. Using a suite of secure voice tools – from secure payment platforms to fraud detection technology – will minimise the risks. This makes the contact centre a far less appealing target for criminals and provides a great experience for your fans." Rob Mellor, Vice President and General Manager - EMEA, WhereScape added: “From the initial selection of players for each team, to their game plan on the day; from the bookies’ verdict on likely winners, to fan sentiment on social media and even the video assistant refereeing; this year’s World Cup competition will be underpinned by data. “However, as any good team manager knows – you can’t train a team by telling them stats. You need to extract the value to make for better sport, and it’s the speed of analysis will be the difference between win or lose. You can bet your bottom dollar both of the teams in the final will be frantically analysing their opposition to gain the competitive edge – and its no different in business. 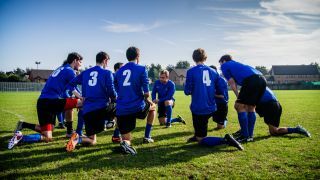 “With a baseline understanding of how the opposition's game is likely to play out, a strategy – or game plan - can be created that will maximise the chances of claiming match victory. The work of cyber security teams has many parallels. For security analysts today, it’s just as important to understand the normal behaviour of all business employees as it is to identify suspicious activity. Understanding what is normal user behaviour – and what is not – is key to uncovering threats. As it is now not uncommon for a large business to collect as much as 300 terabytes of data every day, security analysts are turning to automation to help speed up the process – but the underlying principle is the same. It’s all down to observation, and understanding baseline behaviour." So as we all gather round the radio, TV and computer screens to tune in and observe the game there will be notable parallels we can draw upon when it comes to creating a winning team. However, one crucial difference is that, come July 15th, it will be four years before these teams face their next big test. IT and business teams are in it for the long haul.